A recent purchase by the Department of Library Special Collections bolsters the significant Shaker holdings in Kentucky Library Research Collections. 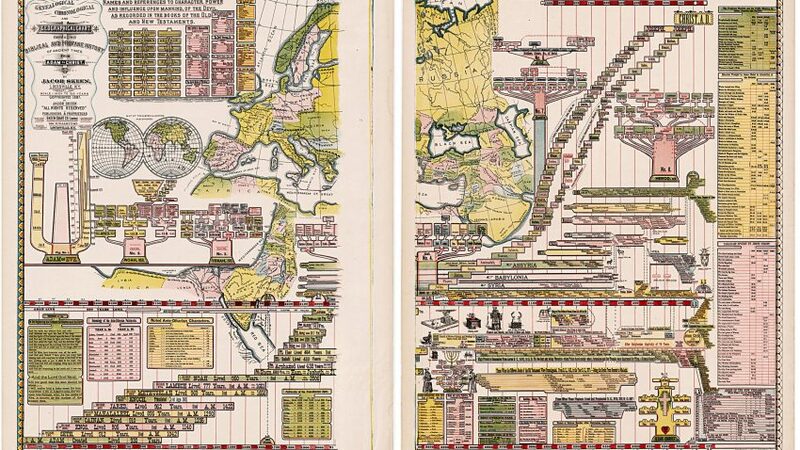 This two-piece timeline map/chart is titled, “Genealogical Chronological and Geographical Chart Embracing Biblical and Profane History of Ancient Times from Adam to Christ.” The map was produced by Jacob Skeen of Louisville, Kentucky in February 1887 as an educational tool to reinforce the traditional Christian validity of Shaker communities and to arrest the decline of the United Society of Believers in Christ’s Second Appearing or as they were more commonly known, the Shakers. Elder Alonzo Hollister of the Mount Lebanon, New York community wished to show that Shaker orthodoxy had continuity with scripture and the traditional church. It was also a grasping attempt to reconcile their beliefs with a fast changing, progressive worldview. 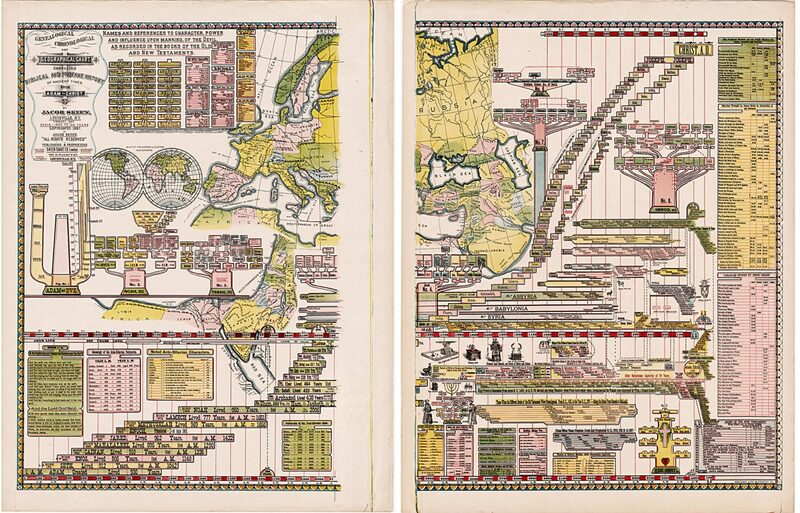 Copyrighted 1887, the detailed chart with many sub-charts purports to show locations and relationships of humanity, the Church and the Devil. W.F. Pennebaker of the community at Pleasant Hill, Kentucky also participated in the publication of this lithograph. David Rumsey, a world renowned map collector and the founder of the David Rumsey Map Collection notes that “although researched, designed, drawn, and copyrighted by Jacob Skeen, a Presbyterian, the chart is strongly associated with the Shaker Church. Skeen spent 10 years developing it and it was to be used in the biblical instruction of children and adults alike.” Some 204 charts were produced, the KLRC is one of only a few holding libraries in the world. The Manuscripts and Folklife Archives has more extensive documentation of the South Union Shakers’ 115 years of existence than any other repository with many Journals, diaries, account books, hymnals, and business records chronicle the activities of the religious community of Shakers, who gathered at South Union in Logan County, Kentucky, in 1807 and disbanded in 1922.